What I like about this dish is its simplicity. This noodle dish is very versatile, suitable for lunch or dinner, throughout the year. 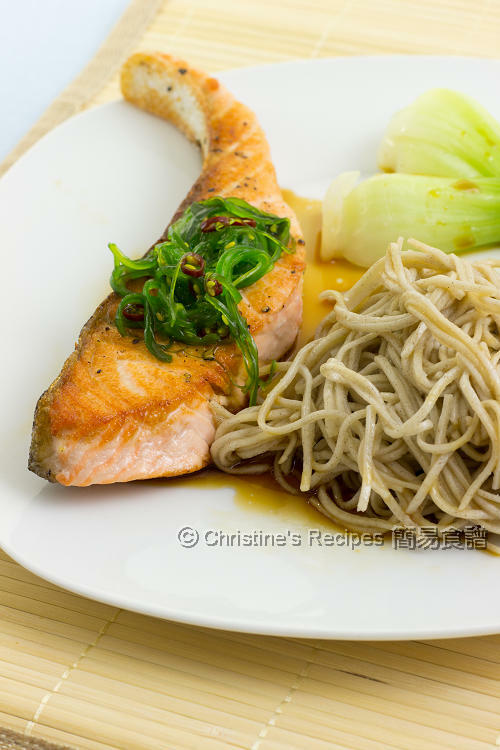 My husband is very fond of the crispy salmon skin, and I love the rich flavours of the sauce cutting through the fish meat. The soba noodles can be served hot or cold. Rinse salmon and wipe dry. Use tweezers or pliers to remove the pin bones. Season with salt and pepper. Heat oil in a frying pan. Cook the salmon steaks over medium high heat with skin side first, until both sides are brown or cooked to your liking. In the meantime, heat a large pot of boiling water. Cook the noodles in boiling water according to the packet instructions, adding the bok choy for the last 2 minutes. Drain and refresh under cold water. Set aside. Heat 1 tablespoon of vegetable oil in a small sauce pan. Saute garlic and ginger until aromatic. Place the rest of the sauce ingredients and cook until sugar dissolves. Remove from heat. 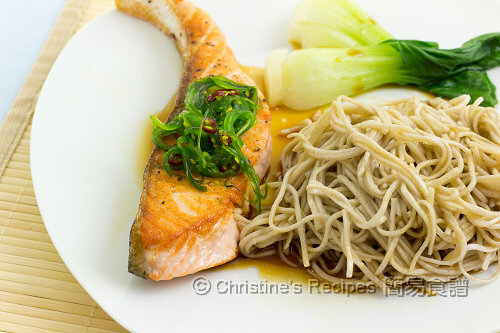 Divide the noodles among two serving plates, with salmon steaks, drizzle sauce on surface, topped with wakam. Serve with bok choy. 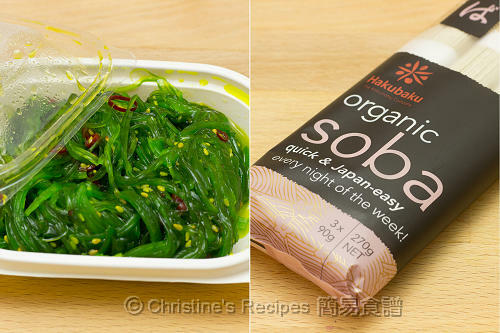 Wakame / seaweed salad is available from Asian grocers. Mirin is a kind of rice wine similar to sake, available from Asian grocery stores. Wow! I am salivating here! Looks great! A lovely meal, the seaweed salad is a perfect accompaniment here. Luscious from its picture alone! I do have my own version of cooking salmon soba noodles... I would like to try this kind of version of yours! Looks awesome!